Sales of Gold Eagles increased from 21,500 oz in May to 76,000 oz in June due to investor’s concern on the financial fallout of a Greek Exit. Something quite interesting took place on Friday last week. The U.S. Mint updated its figures showing sales of its Gold Eagles surged to a level not seen for more than a year. Sales of Gold Eagles have been strong ever since the financial turmoil in Europe increased significantly with the threat of a Greek Exit. Sales of Gold Eagles increased from 21,500 oz in May to 76,000 oz in June due to investor’s concern on the financial fallout of a Greek Exit. However, this was nothing compared to Gold Eagle buying during the remaining days of last week. When the U.S. Mint updated their figures on Monday, July 6th, Gold Eagle sales jumped to 21,500 oz… the same amount sold during the entire month of May. 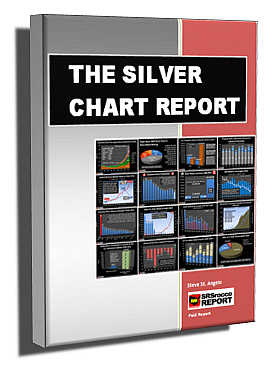 Over the next few days and after the suspension of Silver Eagle sales, Gold Eagle sales reached a total of 30,500 oz. If we compare the U.S. Mint’s Gold Eagle sales in the first 10 days in July compared to sales during previous months (approximation based on taking a third of a full month’s sales), we can see just how much demand increased. Now, some might say the huge increase in Gold Eagle buying is due to the U.S. Mint suspending Silver Eagle sales until August. 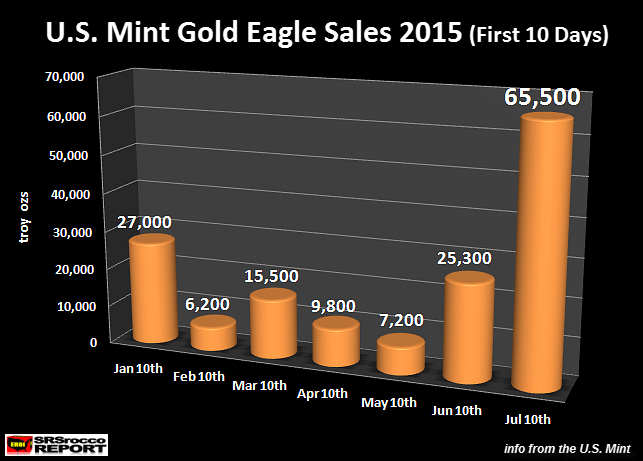 However, Gold Eagle sales started to increase in a big way in June… a month before the U.S. Mint suspension of Silver Eagle sales. Furthermore, some believe the lower price instigated large buyer. I don’t agree. Why? Well, if we go back to March, the price of gold was lower at $1,145 (lower than present) for several days, but total sales of Gold Eagles for the month were only 46,500 oz. This huge surge of Gold Eagle buying was due to investors seriously concerned about the global financial system. Even though the Greek government was able to get some sort of bailout package from the ECB – European Central Bank over the weekend, this will not solve the problem– it just postponed the inevitable. In addition, the Chinese government making it illegal for large institutions to sell stocks is not another LONG TERM SOLUTION… LOL. The U.S. tried that stunt in 2008, but stocks continued to slide regardless. The world financial system is weaker than ever. A bailout package here and government’s making selling of stock illegal are not sound fundamental policies to fix the system. The global financial and economic system (especially in the West) died in 2008. All we are doing now is waiting for gravity to do its magic on the hundreds of trillions of dollars of derivatives and debt that are propping up the markets. This will most certainly end badly. It will be interesting to see how investors perceive this Greek Bailout package. 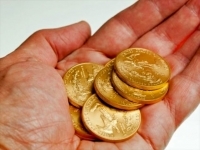 Will Gold Eagle sales continue to be strong this week? I will provide an update in the next few days.